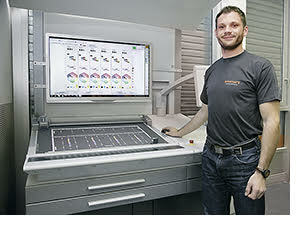 Production Manager, Fabio Wellenzohn, keeps track of all process parameters. By means of the Hexagon diagram he can easily assess gray and color balances, solid densities and dot gains for each ink key. Gutenberg Ltd. at Schaan is the first print shop in the world to implement the InkZone Instrument Flight® solution for conducting color control. Gutenberg Ltd. at Schaan (Principality of Liechtenstein) has partnered with Switzerland-based powerhouses Digital Information and System Brunner to become the world’s first printing company to install the all new InkZone Instrument Flight Gray Balance color control software on the CP2000® control center of their Heidelberg Speedmaster® SM 74-5-P. By joining System Brunner’s leading Instrument Flight color control software with Digital Information’s InkZone ink-presets and closed-loop product line, InkZone Instrument Flight® by System Brunner allows users to harness the power of the world’s leading closed-loop instrumentation with the most sophisticated technology in standardization and printing process verification. Since installing InkZone Instrument Flight, Gutenberg Ltd.’s productivity has increased exponentially, exceeding company expectations — and breaking world records. Until the installation of InkZone Instrument Flight, Gutenberg Ltd. was conducting color control according to the densities in the solids. However, many of the variables that can affect the quality of a printed product were being ignored. With InkZone Instrument Flight, they are now able to take into account an entire range of additional factors, which are essential to maintaining stable color consistency within narrow limits including: dot gain and mid-tone spread, gray balance in the overprint of the three chromatic colors Cyan, Magenta and Yellow (CMY); color balance of the primary colors CMY in mid-tones (50%) and solids (100%); trapping of the three chromatic colors CMY in the solids (100%); and color balance in the solids according to the L*a*b* standard (best match). “By taking into account all of the additional parameters covered by this new technology, we can now automatically print with far less process fluctuations compared with the past, when we could only control the densities,” said Gutenberg Ltd. Production Manager, Fabio Wellenzohn. By producing a commemorative stamp in just 57 minutes and 50 seconds, Gutenberg Ltd. and Philately Lichtenstein achieved an entry in the Guinness Book of Records. Tanja Vetsch of Gutenberg Ltd. proudly presents the certificate. Gutenberg Ltd. is a leader in the book printing industry. Demonstrating Gutenberg Ltd.’s commitment to quality, in 2010, two photographic books that were printed by Gutenberg Ltd. were awarded prizes for “Liechtenstein’s Most Beautiful Books.” Gutenberg’s passion for aesthetics in book production also extends to their printing of postage stamps. They predominantly produce commemorative stamps in smaller editions and partly in polygonal shape by order of the Post of Liechtenstein, Swiss Post, as well as some other European postal enterprises. For perforating the stamp sheets, Gutenberg Ltd. invested in a specialized punching machine just for that purpose. 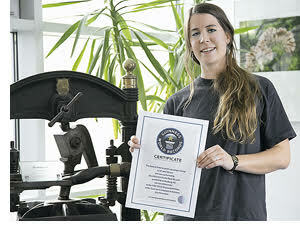 In August 2012 Gutenberg Ltd. and Philately Lichtenstein joined together to set a Guinness World Record. In celebration of the 100-year jubilee of the Principality of Liechtenstein’s first postal stamp edition, a commemorative stamp was produced. The entire operation was completed in just 57 minutes and 50 seconds, beginning with the announcement of the motif which was chosen from three proposed designs and ending with the purchase of the first stamp by Craig Glenday, Editor-In-Chief of the Guinness Book of World Records, at the LIBA 2012 at Schaan, the special stamp exhibition held to celebrate the 100-year anniversary. “The prior world record for Fastest Printing of a Postage Stamp was held by Austria with a time of 1 hour and 25 minutes. With InkZone Instrument Flight in our corner, we were able to blow that record out of the water and to secure a place in this year’s Guinness Book of World Records. We could not be more excited about the addition of InkZone Instrument Flight to our technology arsenal or about sharing the honor of being a Guinness world record holder with Philately Liechtenstein,” said Remi Nescher.